The dropout rate for Mexican-descent students enrolled in the U.S. public school system is among the highest of any race or ethnicity. These students may be functionally illiterate in both English and Spanish. The purpose of this study was to investigate the perceptions of at-risk, Mexican-descent, adolescent students who expressed personal opinions towards academic success or failure, rather than to test a predetermined trait or a priori hypotheses. Thirty-two students from an independent school district in a Houston, Texas, suburb participated in this study. The male and female students were enrolled in school in grades 8-10 but were identified as at-risk learners. Their viewpoints were examined through Q methodology. Factor analysis of their Q sorts yielded three distinct attitudinal factors: (a) internally motivated perceptions, (b) family-motivated perceptions, and (c) disaffected perceptions. Distinguishing statements that represent each factor are discussed and compared against demographic data. The findings of this study support the contextual-ecological view of influences that affect minority cultures and impact school accomplishment. The relationship between academic success and dropout perceptions was multifaceted, comprising social ecological and commingled contextual influences on an individual's perceptions. Results of this study may assist educators and parents in understanding how to increase minority scholastic achievement and decrease dropout rates. 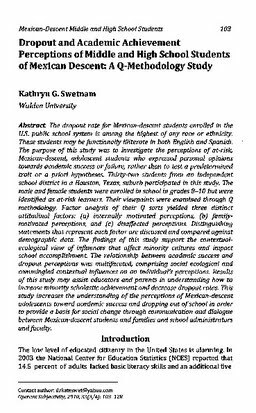 This study increases the understanding of the perceptions of Mexican-descent adolescents toward academic success and dropping out of school in order to provide a basis for social change through communication and dialogue between Mexican-descent students and families and school administrators and faculty.